Donuts anytime is an amazing concept. When you want donuts you can have them. Morning, noon, or in the middle of the night, donuts can be yours. All thanks to Shipley’s 24-hour donuts. Yes, it is! 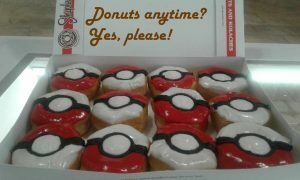 But if you’re still not convinced, read on to see how you can get donuts anytime. You’re about to leave for your first Peace Corp trip overseas and you couldn’t be more excited. There’s just one problem: You need one last check-up before you go and the only time your doctor has is 7 AM. You didn’t even realize doctors saw people this early. And yet you here you are, leaving a doctor’s office. That’s when it hits you. You could get a whole 12 donuts. One box full of all your favorites. Now that’s a sweet send-off before a trip. Yes, Shipley’s is open at 3 AM! You just arrived from a super important business trip. You had been asked to take a quick trip to present something to HQ, but because your business branch is no Rockefeller, you had come back the same day, which meant landing at 3 AM. And you are starving. As you deplane you start to think about options. “Come on,” you think. “There’s got to be some place open now.” But all you see are closed doors and unlit open signs. You’re about to drive home with nothing when you come across a Shiply’s. And it’s open! “Thank god!” The filled donuts you order have never tasted better. Thank goodness for donuts anytime. You’re sitting in science class. It was a tough semester, but you’ve made it this far and can’t give up. Thankfully, your professor decided to give the class a break and play a game of science Jeopardy. You get to relax and watch the people who actually studied answer questions for once. “Correct!” your professor beams, “And you have the board!” Phew! What a close call! You gotta admit, having some glazed donuts does sound good right about now. You just had a killer football practice. It was your best practice yet and your low energy shows it. As you grab your bag you down a sports drink, but it’s not working. You need to up your blood sugar and fast. That’s when your teammate suggests Shipley Do-Nuts. “Nope. All day, man.. I’ve even had donuts at midnight. 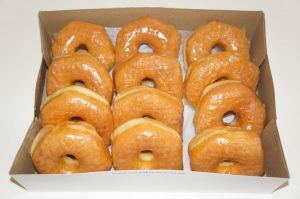 It was crazy but amazing!” You gotta admit, having some glazed donuts does sound good right about now. “Okay, I’m in. Let’s go!” You’re energy’s back up after the first bite. All because you can get donuts anytime. You did it! You finally landed your first gig as a music composer. There’s just one problem. You’re on a tight deadline and the information your client gave you makes no sense. All it says is that the music should be upbeat, then downbeat. You know music, but you’re unsure exactly what that means. As you pop in another donut hole to keep your creativity up, a thought strikes you. “What if I use the donut holes to-YES!” You roll out some wax paper and quickly sketch out blank sheet music. Then, one-by-one you place the donut holes on the sheet to form music notes. And just like that, the song comes together. All because Shipley offers 24-hour donuts. We’ve been making delicious donuts since 1936. If you’re craving donuts anytime, or just want a taste of Houston, click the button below to order Shipley Do-Nuts or call ((713) 589-3292. We have all types of donuts from caked to glazed, kolaches, and let’s not forget our French Quarter beignets. ← Are Donuts Just for Breakfast?